Nat Pagle can be recruited as a follower at the Fishing Shack in your garrison in the expansion, and he has an awesome pet for sale. According to El from El's Extreme Anglin', much like in MoP, you'll want to make friends with Nat Pagle by turning in special "Lunker" fish. In exchange he'll trade you one of his Lucky Coins, and you'll gain some reputation with him. Collect enough coins and earn his esteem and you'll be able to buy the Land Shark (pictured above). Nat Pagle must be the best of the best fishermen if he has pet sharks for sale! Two new pets, the Fruit Hunter and Hydraling, will come from unknown drops, while the Lanticore Spawnling can be found on a new rarespawn in Upper Black Rock Spire in WoD. The last new pet, the Nightfeather Hatchling, will likely be wild. Will its name be an indicator of the time of day these feathery friends will appear? We'll have to wait and see. We recently reported that a new Grand Master Trainer would be at the Darkmoon Faire in WoD, and we finally had the opportunity to check out his team. 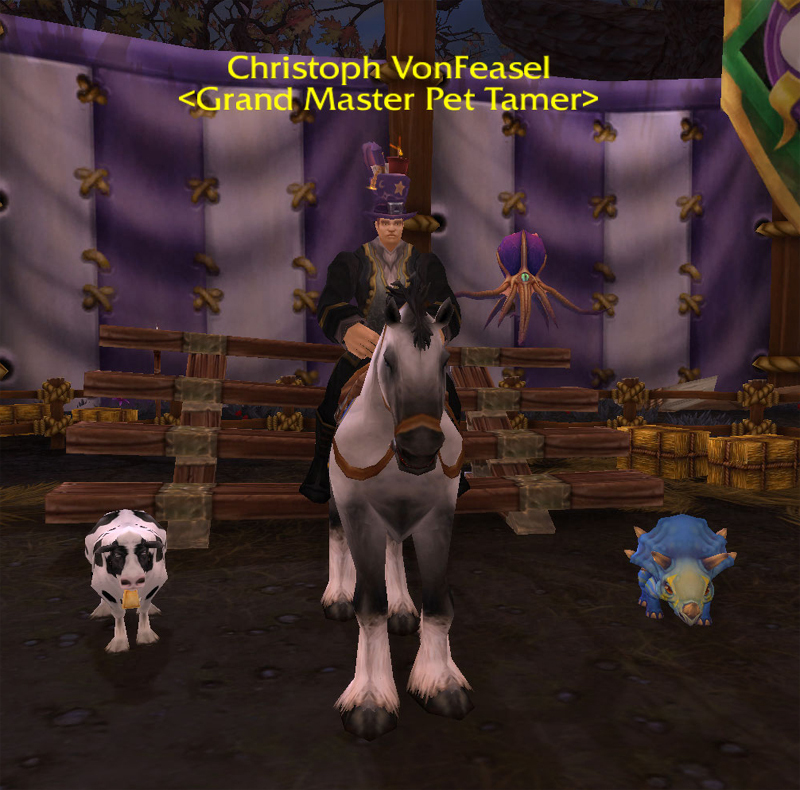 Christoph VonFeasel can be found next to Jeremey Feasel in the pet battling ring at the faire. VonFeasel's team is as amazing as he looks (pictured right). Challenge him to a battle and you'll face Syd, Mr. Pointy, and Otto. Your eyes are not deceiving you, that really is a cow pet! Complete VonFeasel's daily quest by defeating this ragtag team, and you'll receive Greater Darkmoon Pet Supplies. There's a chance that you'll find a stowaway pet inside the reward, Syd the Squid. Do you enjoy playing with your pets and spoiling them with cute costumes and toys? Good news! More fun vanity items are coming in WoD, just for your pets. It's unclear where the Discarded Bone and Rubber Duck will come from. The Small Football will be crafted by Leatherworkers while the Murloc Chew Toy will be made by Tailors. We'll have to wait and see how the recipes will be obtained, however both recipes require level 90 to learn. The toys themselves have no level requirement; pet toys for all! The Black Market Auction House is moving to Draenor in the expansion, and it looks like Madam Goya is expanding her wares. Pets from Throne of Thunder and even more TCG pets have appeared on the BMAH in the beta. So far players have reported seeing Ji-Kun Hatchling, Viscous Horror and Spectral Tiger Cub for sale on separate occasions, but other pets from ToT and the TCG could also be in the rotation. If you're still looking for these pets and want to try your luck on the BMAH in WoD, better start saving up a large sum of gold. As rare imports from Azeroth, these pets probably won't be cheap! Did not think anyone was old enough in game to know about "Candygram". Thank you for making my day battle pet collectors!! Brilliant Spore is from a rare drop (forget the rare) but learning it still doesn't have it show up.